Leader of the Opposition and Tamil National Alliance, R. Sampanthan has demanded that the government immediately return lands held by the military in the North and the East back to civilians. 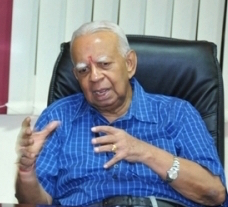 In an adjournment motion moved in Parliament on June 10, 2016, Sampanthan said that even though seven years have elapsed since the end of the armed conflict in the country, several hundred thousands of Tamils and others continue to be displaced from their original places of residence in the North and the East during the period of the said armed conflict. “Unambiguous assurances were given by His Excellency the President and others that displaced people would be resettled in their original places. This was stated to be the definite policy of the new Government. Large numbers of those persons are still prevented from returning to their original homes and to their lands and resuming their livelihood activities/ occupation, primarily due to the fact that the military continues to occupy their lands or due to the fact that though the land is not used, the military has not released the land,” Sampanthan said. According to him, although some steps have been taken to hand over some parts of the said lands to the original owners, large swathes of land are still occupied by the military, which prevents the owners of those lands from being resettled in their own places, and putting the said lands to productive use. “In addition to the land already under occupation by the military, more lands have been requisitioned by the military, the surveying of which has led to agitations by the people against Government surveyors and other officials,” he said. Sampanthan also noted that even though assurances were also given last year that most of the prisoners held under the Prevention of Terrorism Act would be released, however, apart from around 50 persons released on bail, others continue to languish in prisons under law that the Government has promised to repeal. “These prisoners complain that other prisoners similarly held have been released in the past and that there is discrimination against them,” he said. “There is no structured programme of action taken to address the urgent and essential needs of the affected people to enable these people to rebuild their lives by providing them with housing and livelihood support. The engagement by the military in economic activities causes immense harm and deprivation to the local civilian population,” he said.